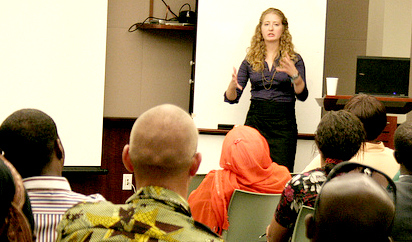 American Fulbrighter Adrienne Strong, during her Fulbright Reflection Series Presentation "Through the Voice of Women: Birth Culture and Maternal Health Care in Singida region," July 21, 2011, U.S. Embassy Dar es Salaam, Tanzania. During each year of her college career, Adrienne Strong has spent time in Tanzania developing a research project in preparation for the Fulbright Program. “By the time I could apply for a Fulbright grant I knew I wanted to continue studying women’s health during pregnancy and childbirth in the Singida region of Tanzania,” says Adrienne. With less than 50% of women in the region giving birth in the formal health care sector, Strong conducted numerous interviews and hundreds of hours of observation at hospitals and clinics. Her research found that interactions between women and their health care workers were creating barriers for healthy pregnancies. “I brought these issues of structural violence to the attention of the health care staff at the Singida Regional Government Hospital,” says Adrienne. “I then presented my findings to a group of health care workers, representatives from the community, and NGO administrators at the U.S. Embassy in Dar es Salaam. Her presentation accompanied other efforts around Tanzania to bring such issues to light. “I feel my research is very timely and adds an important insight into the study of barriers preventing women from taking advantage of available health care services,” states Adrienne. Strong also looks upon her Fulbright experience as a key contributor to her personal growth and independence.